If you thought our regular Skull Soap-On-A-Rope was creepy, check out the glow-in-the-dark version! In the pitch black stillness of the night, The Crystal Skull will be your only companion - his eerie glow being the only thing that breaks the darkness. Not really a sight for sore eyes! 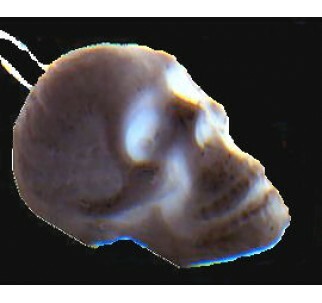 We don't have a clue how Boris, our mysterious soapcrafter has created a perfect 3D skull out of soap. We've stared at him for hours just hanging around on that rope watching to see if he gives up his secrets. Perhaps you'll discover it.... We're dying to know! We can tell you that Yorick is made of 100% pure glycerine soap and has a rather pleasant fragrance considering the 'shape' he's in! If you were ever looking for a conversation piece for the bathroom, this one will definately do the trick. No bones about it!